I thought it was about time to do a photo post! I absolutely love photos and I've been up to a mixture of things lately so what better way to share them than in a post! 1. Top Left: It was recently my birthday and as much as I dislike my age number increasing, I definitely like to enjoy the celebrations. 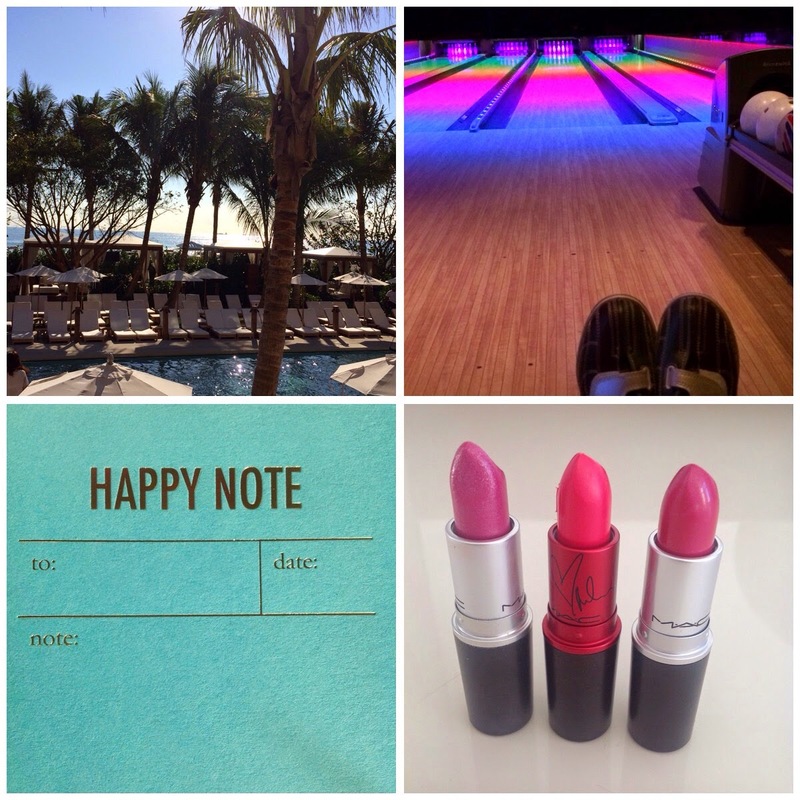 I spent my birthday at The Miami Beach Edition hotel. It's such a stunning hotel and I can do a whole post on this if you like. I had a great stay and what better birthday view is there than blue skies, a beach and palm trees! 3. Bottom Left: I recently got these Happy Notes from Anthropologie. They're notes which come in a rainbow of colours and I thought it would be such a great idea to give them out to people who make you happy. Quite often we don't appreciate those around us enough, so happy notes will change this for me. So if you would like a happy note, just let me know! 4. Bottom Right: Everything I'm buying lately is pink! I've become a bit obsessed and so here are three MAC lipsticks which I'm in love with. Lickable, Viva Glam by Miley and also Milan Mode. Isn't pink just the best! Hope you've enjoyed this post and let me know what you've been up to lately? I thought I'd fill you in on my latest skincare obsession! I finally feel like after so many years of searching, testing, loving and falling out of love with many products that I've actually found a perfect product for my skin. Fortunately I do have good skin, but it is quite prone to becoming dry very quickly especially if I neglect it a little. In the past I have found some amazing products for dehydrated and dry skin which do add that much needed moisture back in. However it has been a slight struggle to get that in between glow balance, because when I hydrate my skin it has a habit of literally glowing a bit too much, think fluorescent light bulb! I've felt like no one product has achieved that perfect middle glow balance that I've been after. Well that's until now! 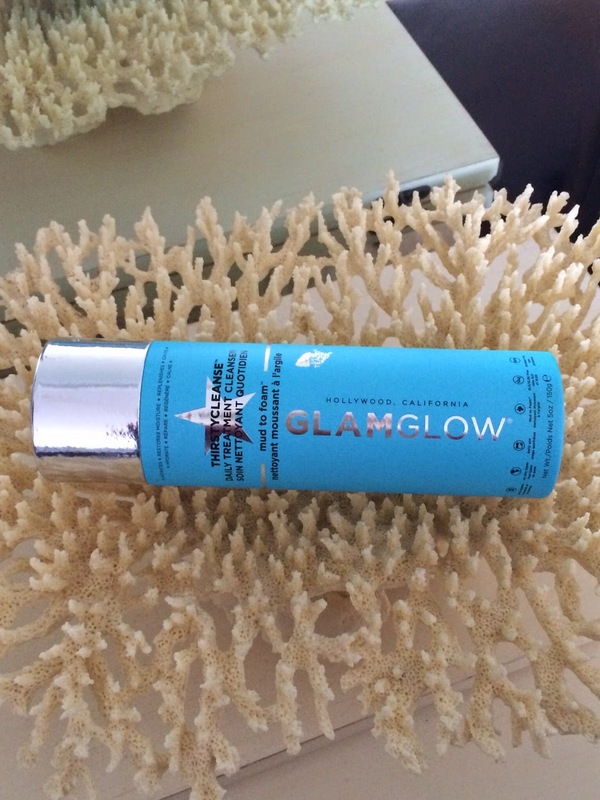 As a lover of the Glamglow Thirstymud mask, I couldn't wait to try the Glamglow ThirstyCleanse cleanser. This cleanser comes in the same distinct blue colour packaging as the mask. The thirstycleanse aims to remove all dirt and impurities whilst giving your skin an intense hydration boost. This is definitely not like your normal cleanser either as this unique formula applies as mud and when mixed with water it foams! When you first apply it, the mud consistency feels slightly tight just like a mud face mask. Then when water is applied it's amazing how foamy this cleanser gets. I love that your face feels so clean and clear with this cleanser, the best bit is that it does actually hydrate your skin at the same time. I love to use it in conjunction with my Foreo Luna. Using the device really offers a deep cleanse and removes all the nasties and impurities. This duo is perfect for me and I'm finally left with that perfect glow. I honestly feel like I never need to try any other cleansers ever again. That's a pretty strong claim for me especially if you know how much time and money I actually spend in Sephora! Have you tried the Glamglow Thirstycleanse Cleanser or any other products from their range? Today is a very special day! 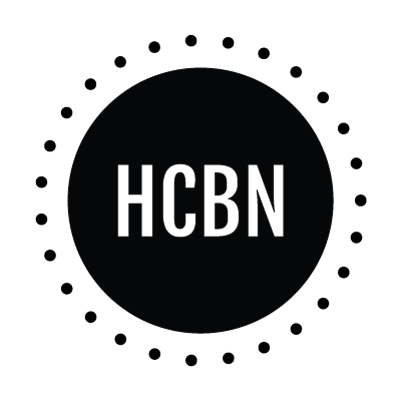 It's my little blog's first birthday. Not only does this mean cake and balloons but it means there's now a whole years worth of blog posts on my blog!!! It's honestly so crazy that I started this blog a whole year ago because it still seems like only yesterday I was typing up my first post. I remember it so so clearly! I never imagined how wonderful and welcoming the community would be and the amount of people I've met through it. I've really enjoyed being part of it and I've been able to meet some amazing and lovely people through it. So I just want to say a BIG thank you for reading my blog, talking to me and giving me lots of beautiful advice. I can't imagine not chatting away to everyone on pretty much a daily basis. Having my blog has definitely made me a million times happier and has provided so many opportunities. It's so great that we're all able to share our loves in life in such a unique way and as we go on our little blogging journeys we can look back at it and see how much we've grown. Anyways I just want to say THANK YOU again and hope you have a Happy Sunday! Happy Friday, I hope you've got some plans for a fab weekend! I've been pretty busy lately but of course I've found some time to do a bit of Sephora shopping! I thought I'd share with you a few of my purchases and I'll give more of an in depth review in the future! 1. 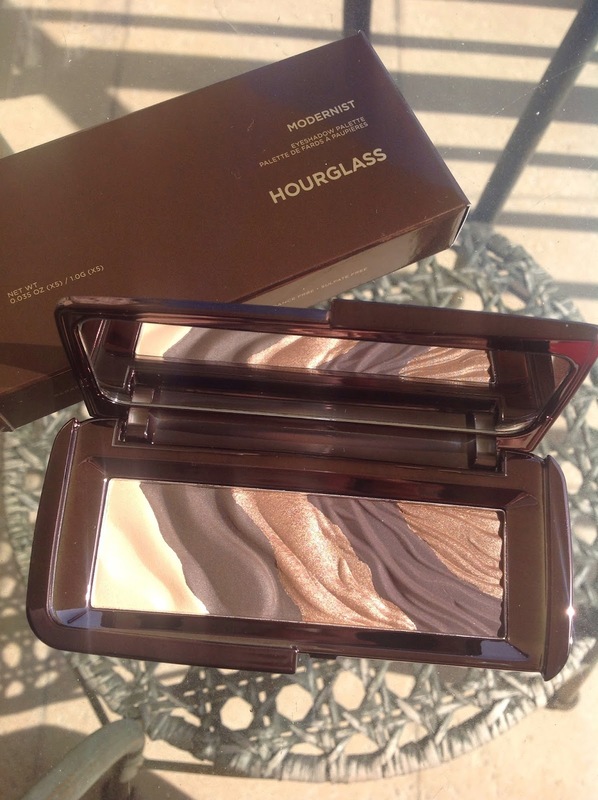 Hourglass Modernist Eyeshadow palette in Obscura. This is so beautiful and as soon as I knew more colours were being released from the original Infinity one I had to jump on board. The only problem was which palette colour to choose, it was one of the hardest decisions of my life!!!! I opted for Obscura, it has some gorgeous earthy tones. I loved the look of Monochrome too but I reckon it's pretty similar to the Naked 3 palette, however I'm sure it'll end up finding itself a new home with me in the future. I'm a top fan of the Glamglow Thirstymud mask so I needed this cleanser in my life. So far this is the best cleanser I've ever used. My skin feels so clear, clean and healthy. I use it with my Foreo Luna, and the mud which turns into foam formula is so unique. I'm in love with it already. I'm trying to get my hair in tip top condition, it's quite dry and prone to breaking so I saw this set and thought why not! 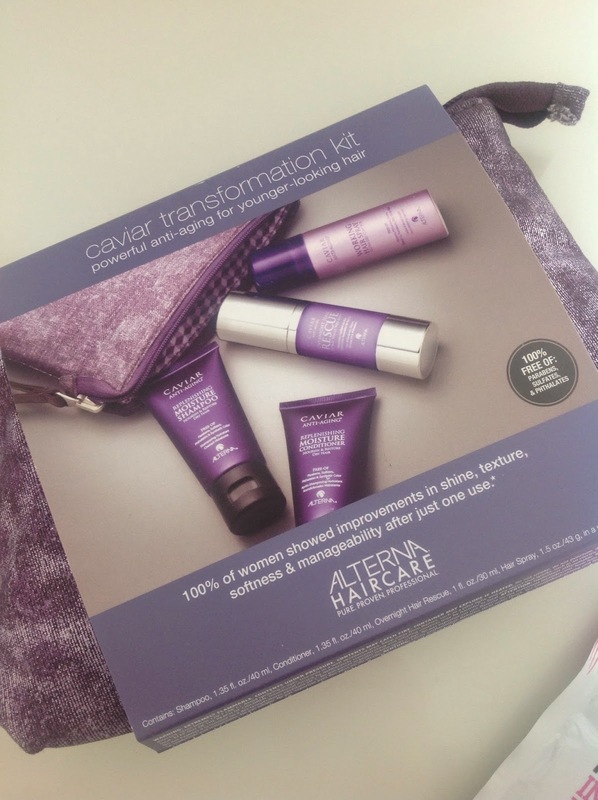 This set includes a mini shampoo, conditioner, moisture working hair spray and overnight hair rescue. 4. Little VIB Rouge NARS Birthday Gift! Even though my birthday isn't for a few more days, I keep receiving birthday gifts from Sephora. I have 3 of these so far, I'm not really sure why I keep receiving them but I'm not complaining! It contains 2 mini lip pencils in Cruella and Rikugien as well as a mini eyeliner. I'm definitely stocked up for a while! I cannot wait to give all these products a real go but they all seem incredible so far! Have you tried any of these or what have you been splurging on this month? I hope you had a great weekend and are having a great start to the week! Finding the perfect scent can be a little tricky so I absolutely love giving them a test and using little mini versions to find a new favourite scent. 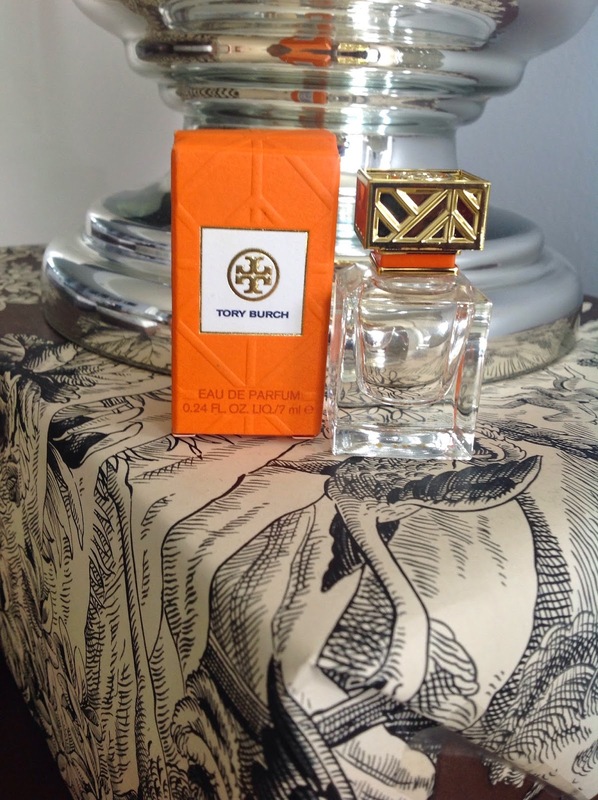 Today I have a beautiful little mini of the Tory Burch fragrance. I just adore the packaging and little bottle. Even for a mini product they still go all out with their classy orange packaging and beautiful little bottle. Definitely a chic little scent! The fragrance itself is light, citrus and floral. It has peony and grapefruit flavours which makes it smell very fresh and feminine. Even though it is a beautiful scent especially if you're a lover of these kind of notes, I do find that the floral scent is quite overpowering and is possibly a bit too strong for me. I think I'm suited to the perfumes which are a bit more toned down with muskier notes. Overall it's a lovely scent which is absolutely perfect for spring/summer, however I don't think it's the perfect one for me and it's not the most unique scent! Finding a perfect perfume is so individual and even though I love trying out new ones, I always find myself homing back to my firm favourite fragrances. Have you tried this perfume or have a favourite fragrance? It's Friday! The best day that starts with an F! 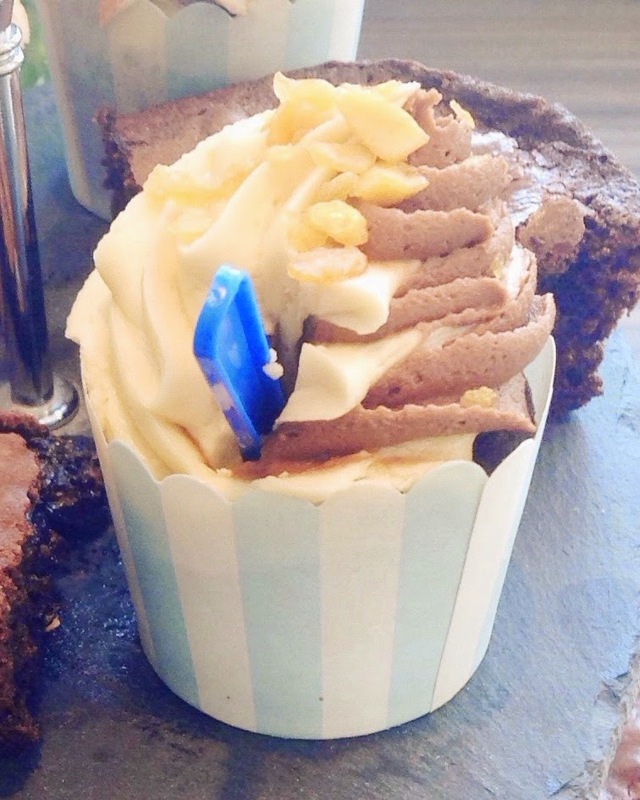 This Friday it's time for a little sprinkle of MAC! I'm in a bit of a pink mode since I've moved to the sunny state of Florida and what better way to release my inner pink than wearing a beautiful bright pink lipstick! 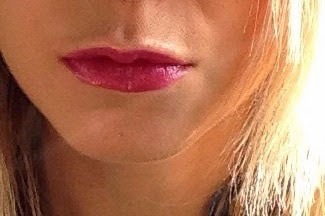 The lipstick I've been gracing my lips with is Milan Mode! This lipstick is a lustre finish which usually aren't my favourite but in this instance I feel that this gorgeous pink shade is extremely suited to this finish. It's a beautiful fuschia pink shade which has a lovely glitter shimmer to it. It's not glitterball overload though, once applied to your lips with about 3 swipes the glitter lifts the lipstick in a natural way and no hint of looking like you've caked your lips with glitter! 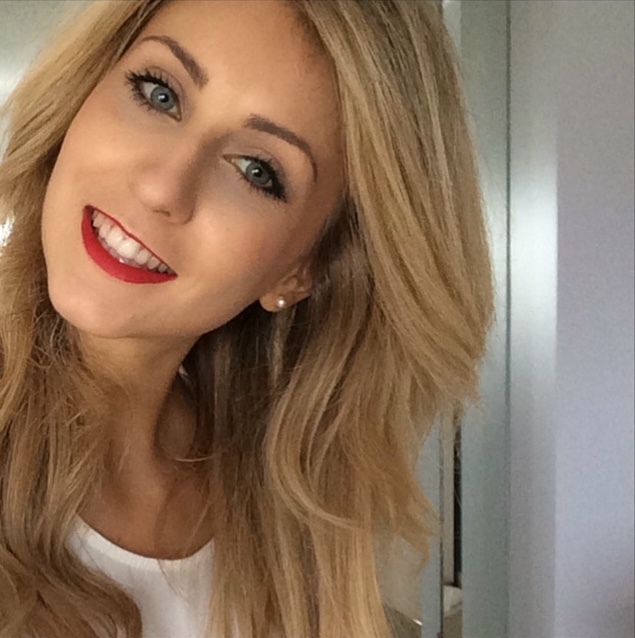 Milan Mode lasts quite a while on your lips and is great because it doesn't dry them out at all! I'm finding myself reaching for this gem a lot as it definitely delivers a bit of summer in winter. If you feel like brightening things up, this is a really beautiful shade! I've also been eyeing up the bright pink shades from the NARS Audacious range so if you have any lipstick loves from this range, please let me know! 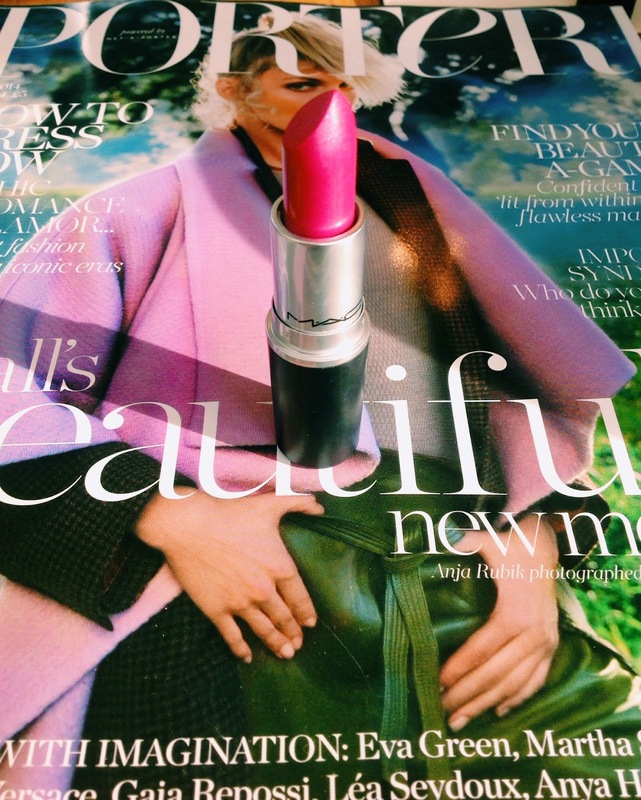 Do you have a favourite bright lipstick to brighten things up? So this is my first post of the new year which is very exciting. Even though we're only 5 days into 2015 it's been a pretty busy year for me already as I've actually moved homes. Not only have I moved homes but I've actually moved countries to the USA! I am now properly living in Palm Beach, Florida so waking up to palm trees and blue skies every morning certainly feels like I'm on vacation. After attempting to unpack my life from numerous bags and suitcases, I've decided I need to start feeling a bit more organised. So here are a few things which are helping me to feel more on top of my life whilst searching for my favourite top or lipstick still appears to be a treasure hunt! Filofax Identity Leather Look Personal Organiser. The ultimate tool for organising your life! 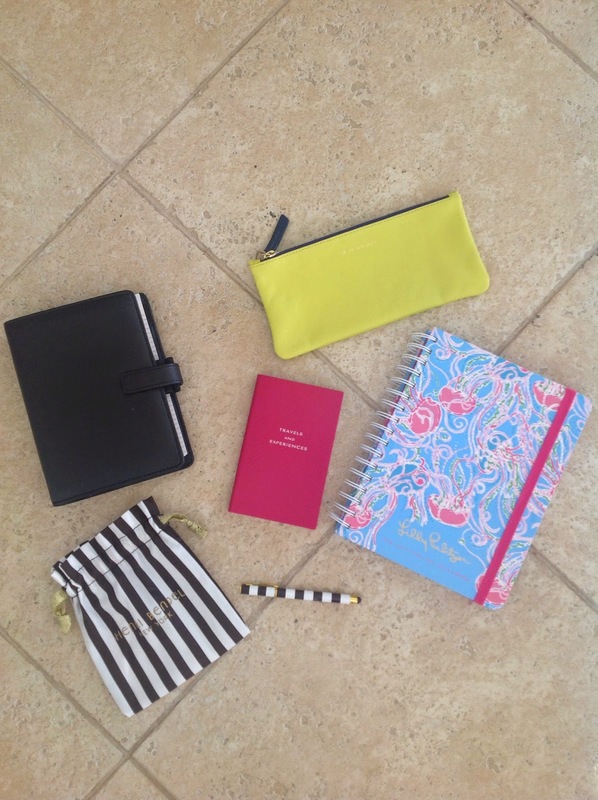 Lilly Pulitzer journal. I love this design it's so Palm Beach which is probably why I love it. Henri Bendel Pen. 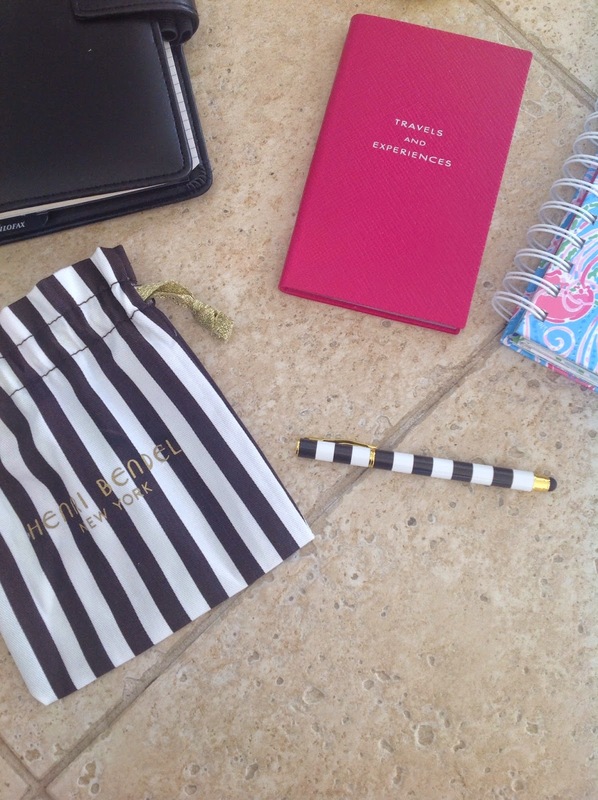 I have an obsession with Henri Bendel, the brown and white stripes get me every time! Smythson Notebook. 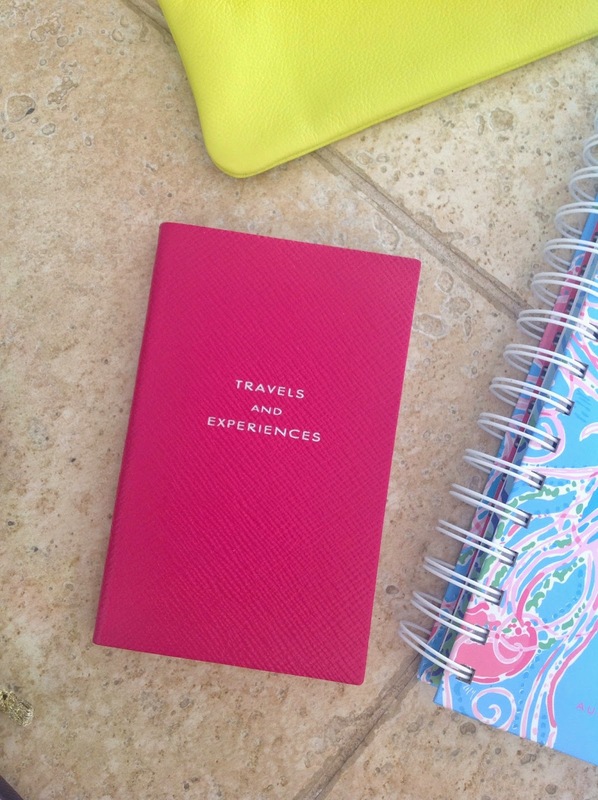 Of course I chose the pink one it's for Travel and Experiences and these are both things which I love doing and I aim to fill this up in 2015! 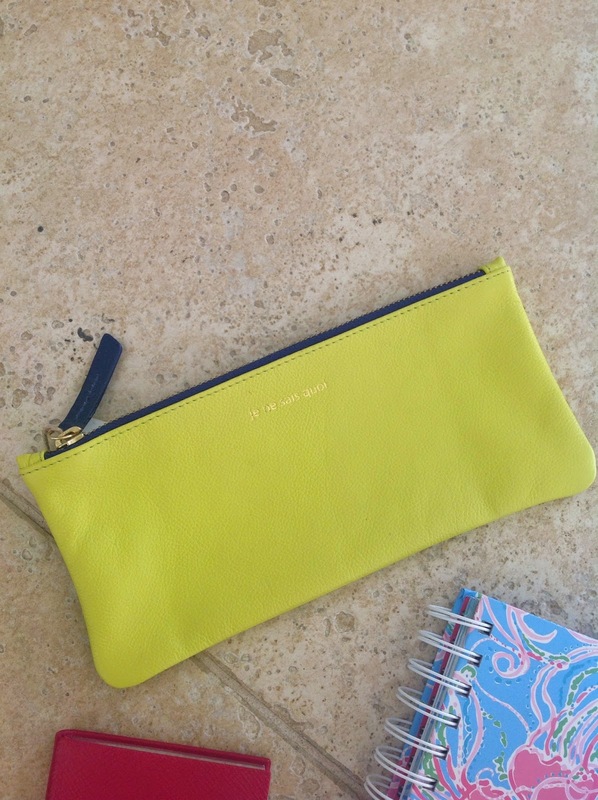 Anthropologie pencil case. This was too good not to get. It says 'je ne sais quoi'. I love things which have phrases on them. I still feel like I need some pretty pencils in my life so if you know of any please let me know. These things definitely spur me on to feeling a bit more organised, pretty tools are the way forward for me! Are you feeling organised this new year if so what are your organisation loves?